A compact, versatile reverb that has enough unique features to make it well worth considering over mainstream contenders. Mad Professor is one of the original boutique pedal companies, and its reverse-engineered circuits have long been staples of the DIY and modding scene, inspiring tweaks, redesigns and new builders. 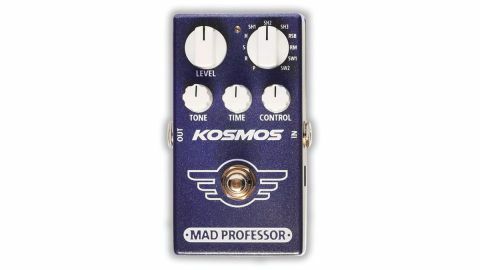 Let’s look at a Mad Professor original: the multi-function Kosmos reverb. Given its small footprint, it’s a surprisingly feature-rich unit. It’s billed as an ambient reverb, mainly because the footswitch pulls double duty - it’s not only a standard on-off switch, but when held also triggers ‘freeze’ functionality, resulting in infinite reverb. Changing to the swell reverb patches affects the function of the footswitch, allowing the user to trigger volume swells and other interesting momentary effects at will. Besides the standard controls for tone, level and time, each patch has a variable parameter governed by the control knob. Mostly, this varies the duck depth - how low the reverb mix is pushed when you are playing - though on the swell patches it controls swell rate, and on the combined reverb and delay patches it covers delay intensity. It’s in the duck modes that the pedal shines, however. While the swell modes are useful, the plate, room, hall and shimmer sound just too good to not be the main attraction, and the ability to crank the time and level, then ride the duck control to avoid things getting overwhelmed is fantastic. Kosmos shines on textural work, tremolo picking and glacial arpeggios, but the spring reverb patch is convincing, too; on more sedate settings you could even crank out blues licks using that patch. More versatile than it looks!